I have often gone to this pub, particularly when there are bands on. I went to see a particular band, getting there just after 9 pm, and it was advertised as being free till 10 pm. They tried to charge me to get in, even after a member of the band showed them the advertised information. Eventually the security guy said that I would be allowed in, but he continued aggressively blocking my way and clearly wasn't going to let me in unless I grovelled. I am not going to grovel to someone who I have just caught out trying to rip me off. I will never go to this pub again. 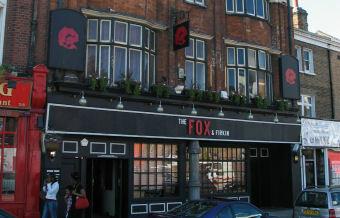 An early Friday night visit to the Fox, the first time for a few years. I go past this pub twice a day and thought now would be the right time to have another visit. For the first five minutes of my visit I was the only punter in here, there were a few staff members put a whole host of xmas decorations up and they looked pretty good. The 6 hand pumps were mostly redundant apart from the 2 Sambrook's ales that were on...Junction and Wandle. I opted for the Wandle, it was fine and it £2.95 was good value for money though I'm not a fan of Sambrook's beer. There were a couple of interesting lagers on tap namely Brahma and Frankishaner. Music playing which helped to not make the pub seem so empty. Nice enough pub, put different ales on and I might come back sooner. Great pub, not a bad beer garden. Very friendly barstaff. And Tuesday evening has great price deals. This is a good pub. The prices have gone up in the last few years although its still quite reasonable. The garden out back is first class. There are no yobbos in here, most of the customers are chilled out. Good music at the weekend and the quiz is decent midweek. This pub has to have had a makeover since the last reviews. The decor is retro chic in black and white. The staff seem friendly and the (ladies) loos smell pleasant and look reasonably clean - though they don't have locks. Can't really comment on the quality of the beer as I'm not an ale expert, but they seem to stock a wide range of bottled stuff and lots of fizzy lagers on tap. They do coffee and fairy cakes and pizzas that looked & smelt really tempting. Regular live music. I'd defintely go again.